The longer you study the question of physical strength the more you become impressed with the great necessity of symmetry--or all-round development. The word "symmetry" implies a balance of parts. Most people think all that is necessary to symmetry is that the left half of the body be exactly equal in size to the right half. But there is more than that to physical symmetry; for as applied to the body symmetry it involves proportion. No man with big arms and shoulders and slender legs can be called symmetrical. And neither can a man who has massive legs, surmounted by narrow shoulders and puny arms. A man who is absolutely symmetrical will have shoulders of a certain width in proportion to his height; his legs and arms will have a certain length in proportion to his body; and moreover the girth of his arms will bear a definite relation to the girth of the chest, and the girth of the thighs to that of the hips. Absolute symmetry has probably never been attained by any human being and is only approached by some few noted "Strong Men." There are men who go around the vaudeville circuits exhibiting their strength, who come close to being perfectly symmetrical. In fact they bill themselves as "perfect men" and they actually get more applause when they pose and exhibit their flawless forms, then they get when doing their feats of strength. The public, which after all, is composed of average human beings, loves bodily beauty and likes to feast its eyes on physical perfection; whether it is a "Strong Man' doing "classical poses" in the lighted cabinet, a beautiful woman behind the footlights, or either one of the two on the beach in a bathing suit. To resume the discussion. Has it ever occurred to you that his symmetry may account for a large part of a "Strong Man's" power? I can assure you that it is a fact. Further than that, I know that if a shapeless, undeveloped man takes up "exercise," and practices with the aim to make himself as symmetrical as possible, that as he attains symmetry he will also attain strength. When he becomes unusually symmetrical he will become unusually strong. This is because of the interdependence of the different parts of the body. You can perform an act which requires but little exertion by using the muscles of only one part of the body, but when you do something which necessitates putting forth a lot of strength, then the work is performed by, and shared by, a group of muscles. Thus you can take a tiny hammer in your hand and drive a thumb-tack just by moving the hand at the wrist-joint. If you had to drive a railroad spike through the three-inch top of a wooden bench, you would use a heavy hammer, grasp it firmly, raise your right arm high above the head and bring it down with great force. As you swing the heavy hammer upwards, the muscles of the forearm, the biceps, and the shoulder muscles would be at work, and as you smashed the hammer down, you wed be using the muscles of the back as well as of the arm. Watch a man driving a drill with a long, two-handed hammer. As he whirls it up he will bend backwards at the waist, and as the hammer comes down he will bend forward from the waist; and just as the hammer hits the drill he will bend his knees slightly. By delivering the blow in this way he will get all the advantage of his weight plus the momentum of his swinging body and arms. In other words he reinforces his arm muscles with the muscles of his body. 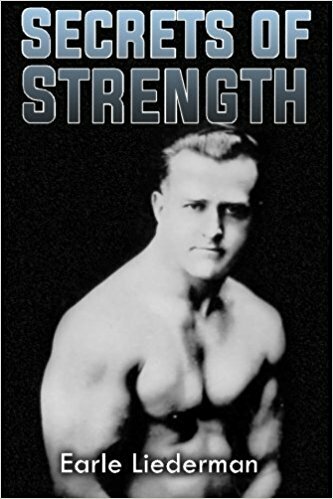 A "Strong Man" when performing a feat which requires a great expenditure of strength, will instinctively bring into action just as many muscles as possible. 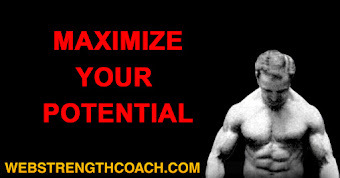 Since all of his muscles are strong he can exert extraordinary power by making his muscles act in concert. 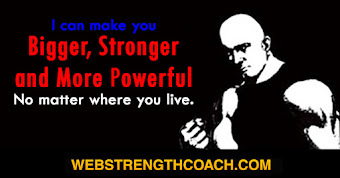 That helps to establish the connection between symmetry and strength; or perhaps it would be better if I said, between all-round development and strength. 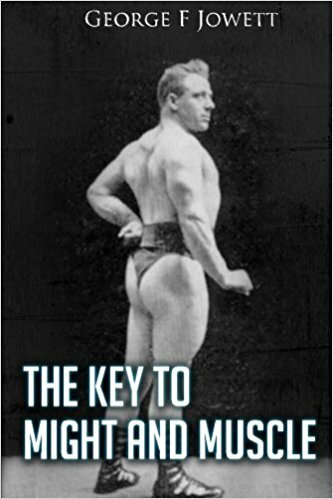 In another book of mine I recommended exercises which employ groups of muscles, instead of one muscle at a time. When exercised in groups the muscles acquire the power of working in concert; which is known as co-ordination. That, however, is but one of the beneficial results. A greater benefit comes from the increased strength and control of the joints. For almost every muscular contraction results in the movement of a joint. When an Irishman says, "More power to your elbow" he is actually wishing you more strength in all the muscles of your arm. When you say that man has a strong shoulder, you mean that he has strong muscles in the neighborhood of the shoulder. In the case of any joint, power is located on either side of the joint. The biceps is only one of the muscles which bend the arm. There are muscles in the forearm which help. Just as the lower tendon of the biceps is attached to the bone of the forearm, several muscles of the forearm are fastened at their lower ends to the bones of the hand and at their upper ends to the bone of the upper arm. So when you bend your arm part of the power is supplied by the biceps pulling against the bone of the forearm, and another part by the forearm muscles pulling against the bone of the upper arm. When you "chin the bar" you can easily see both sets of muscles at work. As you bend the arms to lift the body, your biceps muscles will rise up in a hump on the front of your arm above the elbow; and at the same time your forearms will bulge out just below the elbows. For "chinning" develops all the flexors of the arm; and furthermore teaches your arm muscles to contract strongly in any kind of stunt or work in which it is necessary to bend the arm forcibly. 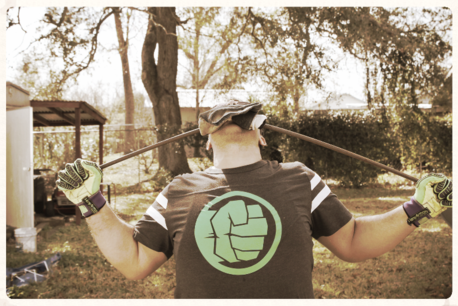 That sort of strength is entirely lacking when the arm muscles have been built up by the 'extreme contraction" method. I saw that clearly demonstrated when I put a couple of young fellows at curling a 50-pound weight. Each had arms which measured about 14 inches around the biceps. 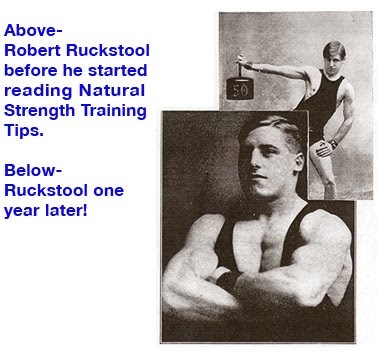 "A" had gotten his arm development by "chinning," rope-climbing and such work, and he "curled" the weight a couple of times without much effort. (In "curling" a dumb-bell, you allow the arm to hang by the side, and then without moving the elbow you raise the hand holding the dumb-bell, from hip to shoulder by bending your arm.) "B" was not able to curl the bell once; in fact he could not even start to bend the arm. "A"'s superiority was not due to practice, for it was, he admitted, the first time he had ever had a 50-pound bell in his hand. But his arm, all of it, from wrist to shoulder was used to vigorous work. Whereas "B"'s muscles had seldom worked against resistance. When working on his biceps, he would, as already descrivbed, bend his arm and force his biceps into a lump by an effort of the will, and meanwhile his forearm muscles were not even tense. And when he tensed his forearm muscles to develop them, his biceps were not even in action. So much for the difference in strength. The difference in appearance was even more marked. "A" had a capable-looking, well-knit arm, which looked as though it could do something. But "B"'s arm, notwithstanding the size of its biceps, was not impressive. It seems to lack size right above the elbow, and right below the shoulder. His forearms did not merge properly into the upper arm. Indeed, to an expert, it was very plain that his arm-muscles had been developed individually, and that they had very little power of working together with their neighbors. That is just one illustration. I could give others, such as the peculiarly shaped and weak-looking thighs on men who have practiced but one kind of leg exercise; who have all the muscle in bunches right above the knees, and whose legs and hips seem to be hardly related to each other instead of being closely connected. 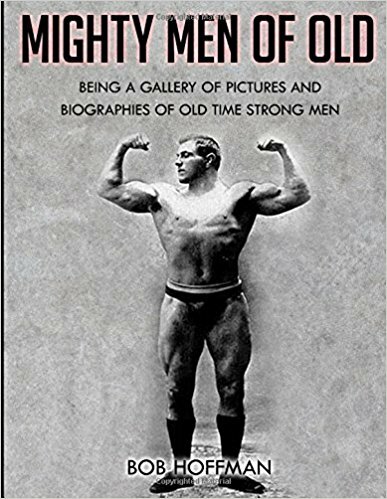 If you made a close study of the muscular make-up of a great "Strong Man" you would find a peculiarly well-knit condition in all his joints. Where the arm joins the shoulder you would find that his deltoid muscle would form a big cap over the joint itself, and that you could trace the lines of the deltoid almost to where its tendon fastens near the middle of the upper-arm bone. The big pectoral muscles would not show just near the breastbone, but would extend right across the breast to the arm-pit. When he lifted his arm the breast-muscle would seem to flow into, or merge with the shoulder-muscle. His upper back, when in action, would appear to be possessed of more individual muscles than you would think possible, and as he moved his arms about, these back muscles would shift about in ever-changing contours, seeming to slip under, or play over each other. And as for his legs, well: it would be difficult for you to say just where the thighs stopped and the hips began. Instead of the thigh muscles appearing to stop at the top of the leg itself (as they do in ordinary human specimens), the muscles on the outside of the thing would rise in one sweeping curve, from the knee all the way to the top of the hip-bone. And there they would disappear under the great muscle at the side of the waist. On his back there would be a great chain of muscles all the way from the base of the skull to the back of the ankles. At the top the trapezius muscles, of such shape and size that they made the neck merge into the shoulders; then the two great ridges of muscles along either side of the spine; next the firm buttocks; then the great outward swell of the biceps in the back of the thighs; and last of all the powerful muscles of the calf. When you thus see that every part of his body is adequately covered with muscle, and as you watch hi move any part of his body with seemingly irresistible power, you comprehend how being symmetrical and well-knit will add to a man's strength; and it makes you realize that, with muscles, as with everything else, "In union there is strength." While we are on the subject, let me see if I can make clear the way the muscles help each other out. You have just, in imagination, been studying the back of a "Strong Man." Let us suppose you admit its development and that you ask him to display its strength. Thereupon he places two chairs about four feet from each other; lies down with his head and the back of his neck on one chair, and his heels on the other; and allows you and two of your friends to stand, one on his thighs, the second on his stomach, and the third on his chest. In order the support the weight, the body must be kept in one rigid straight line; and that is done in this case by an almost violent contraction of the muscles of the back itself and the muscles which run along the back of the legs. Naturally the only place at which the body could give way is at the hip-joints. You may argue that the legs have little to do because even the greatest imposed weight would not make the knees bend backwards. But the legs have a lot to do, because in order to keep his body from sagging the athlete has to dig his heels violently against the seat of the chair, and the force with which he can press with his heels is governed entirely by the strength of the buttocks and the muscles on the back of the legs. Of course almost all the muscles of the back are busy, for the spine must be maintained in a straight line; but what I emphasize is that the muscles below the hip-joint, that is of the legs, have just as much to do with keeping the body straight, and the hips from sagging, as do the back muscles which are above the hip-joint. Now a man who can do that stunt must necessarily have well-knit hips, and no joint can be well-knit unless it has strong muscles on either side of it, and strong tendons crossing it. Now I can safely say that the average physical culturist cannot do that stunt because he has not the necessary muscle. No amount of club-swinging, or free-hand calisthenics will develop heroic strength in the lower back, or in the rear part of the legs. But almost any big professional wrestler will do it, and so will many tumblers, oarsmen, football players, and men who do heavy labor. 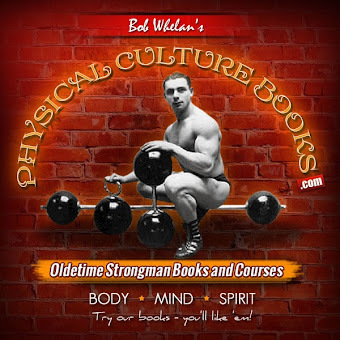 I long ago found out that it was the constant use of the back, which gave such great strength to some of those laborers; and my criticism of most "exercise systems" is that they pay insufficient attention to creating back-strength. A young fellow who exercises in his own room will spend half an hour doing exercises that afford vigorous work to his arms, shoulders, chest and upper-back muscles; and when it comes to his loins and the back of his legs, he thinks he has given them enough work if he leans over, swings his pair of 5-pound dumb-bells between his legs, and then straightens up, swings the bell overhead and leans backward. A workman will think nothing of picking up, and piling a stack of cases weighing 50 or 75 pounds apiece. 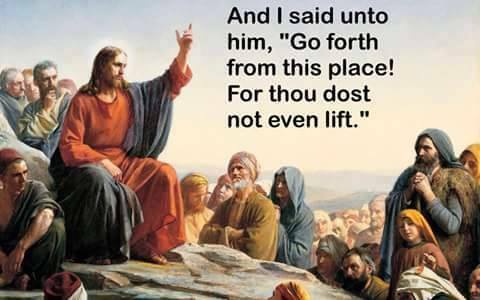 Or he will lift packages weighing as much and with a heave of his body, and a swing of his arms, toss them to another man standing on a platform above him. And the exertion is nothing to him because his back has become tremendously strong from doing that sort of work day after day and year after year. Occasionally at a bathing-beach, one man will stand with legs firmly planted, a second man will sit on his shoulders, a third man climb up and sit on the second man's shoulders, and then some powerfully made young fellow will lean over, slip the back of his neck between the first man's crotch, and slowly stand up, lifting all three men with him. Naturally a strong neck is necessary, but there must be strong back muscles, and very strong muscles along the back of the legs. The strongly muscled legs form the anchorage against which the back muscles exert themselves. Now once more, a man who can thus lift three men on the back of his neck is the very fellow who can do the stunt of lying on the two chairs. And if you test him you will find that he can do another feat which employs the same leg muscles. Let him stand erect and take a firm hold of some firmly placed object, to give him a brace. Then ask him to raise his right foot backwards (without moving his knee) so that the right calf will extend out horizontal and at right angles to the thigh. If you stand on his right calf with one of your feet on the back of his ankle, and your other foot on the fleshy part of his calf you will find that your weight is not sufficient to force his leg downwards. Why? Because he has tremendous strength in the back of his leg, the biceps of the thigh, which has been developed through his constant handling of heavy objects. All the foregoing was written just to give you an idea of what is meant by being "well-knit." If I had the space I could go on and give you similar illustrations showing that the same principle applies to all other joints; how for example, when a man has great strength in his sides--can keep his body straight against a great pressure that would bend the body sideways at the waist--you will always find that in addition to having great muscles on the sides themselves, he will also have great muscles on the outside of his thighs. That when a man has great muscles on the front of his abdomen, he will have great muscles on the front of his thighs, and so on. If you keep in touch with the sporting papers, you will notice many pictures of those Herculean heavy-weight wrestlers; most of them big men, developed from head to heel, and obviously possessed of great strength. Wrestling develops most, but not all of the muscles. 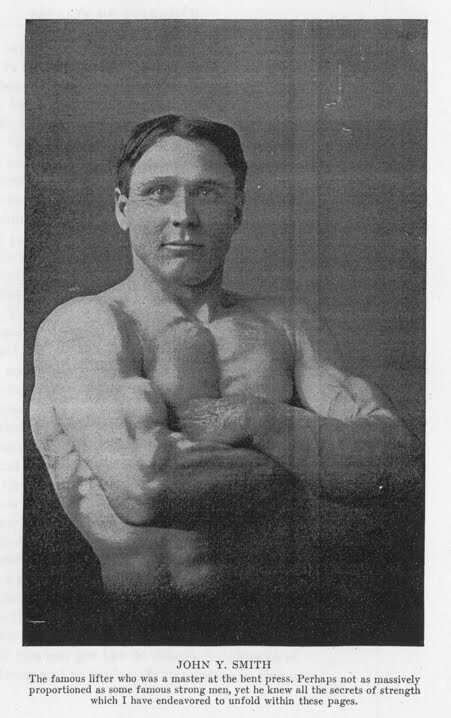 When a wrestler takes the trouble to supplement his exercise with stunts that develop the upper extremities and which still further cultivate his body and leg-muscles, then you get a sample of super-power and super-shape like George Hackenschmidt.